Just once every now and again a band appears which changes the way you see metal for good by doing something so suprisingly different that it opens your eyes to a whole new direction. Pantera, Rage against the Machine, Korn, Alice in Chains, the list is different for all of us, but you know when you have heard something special. For me, Rothgar were one of those bands. To understand the era, you had to be there and of course few of you were. 1992 seems only the other day, but in terms of recording and communication technology it may as well be another century. Nobody much had mobiles phones, There was no internet to reach out to the whole Earth, not much in the way of local distro networks to cast Metal out into the wider world. Although studios were up to the task of recording good quality albums, home recording capabilities were limited to cassette deck systems like Tascam 4-trackers and the like, analogue recordings done by extensive overdubbing rather than seperate tracking. Hell, much of what we take for granted today simply wasn't there. If you wanted to find out about Metal bands, you bought Hot Metal Magazine. Your mate would call you on the land line to tell you that he has copied a tape for you of this new Black album by a band called Metallica. No dowhloads. No websites. Few CDs. It's hard to conceive even for me, and I was there, in my late teens. So when Rothgar released "Inside the Glass Confines", it didn't make a huge splash. Outside of the few of us who were going to gigs regularly or like myself playing in another local extreme band, it was virtually unheard of. The recording quality was not super flash, the tape cassette was not loud and had to be cranked up a fair bit which made the recording a bit hissy. It turns out that vthe whole album was recorded on a hired 8-track in a bedroom. The artwork was hand drawn and photocopied, as were most demo tapes of the era due to colour printing being much more expensive then. In a world where Metallica was number 1 on the charts and bands like Fear Factory, Sepultura and Machine Head were about to leap forth from the underground and conquer the world, nobody much was paying attention to a little demo tape from Perth. The Drums are spectactular for a guy so young, fast as lightning when it was needed, subtle and muted when necessary, tribal and inventive. Adam is amazing here, the thrash influence is there in the ferocious bits, but they are no much more alive and free-flowing than most thrash drummers allow themselves to play. Rothgar are masters of the unusual timing structure with every song having little twists in the fabric, and the drums not only deal precisely with these twists but make them sound like genius. Some of these timing signatures are jarring enough that I will not be truly appreciating them until years later. still these cursed woulds are bleeding"
Rothgar's style greatly influenced me on my journey through metal, inspiring me subconsciously in my future endeavours with the bands that followed and eventually shaping the style of Neverborn, although there is no simillarities in the music itself. "Inside the Glass Confines" was a spectactular album for its time, and even now is remarkablely relevant. The members have long gone their own ways, forming and later disolving such bands as Leaf, Non Intentional Lifeform (NIL) and eventually - strangely enough - one became the drummer for Killing Heidi. How the mighty have fallen. But in all the times I saw them play and all the years I have mistreated their tape, the memory that stays with me most strongly of Rothgar is this: When I was about 20, Pantera toured and I and my girl - now my wife - spent the night outside the Entertainment Centre waiting to buy tickets. 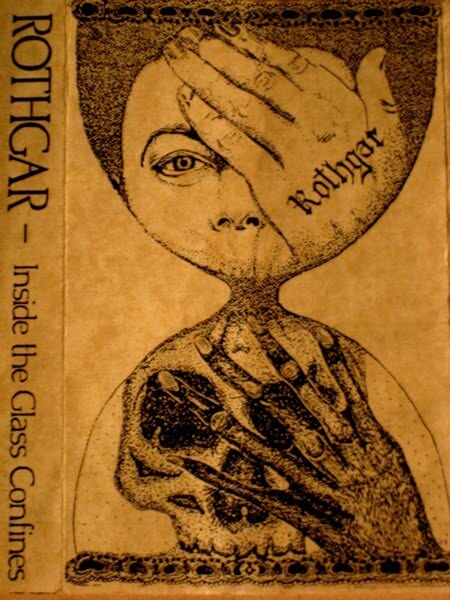 One person had a CD player there and he was playing all the usual stuff, and then he popped Rothgar's "Inside the Glass Confines" into the tape slot and we all had a joint and listened to the whole thing through. It was a great moment to be alive.